LONDON, 17 June 2014—The Transparency and Accountability Initiative is proud to launch a practical new guide for transparency campaigners planning and executing technology projects. 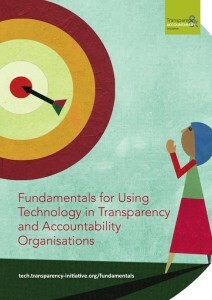 Fundamentals for Using Technology in Transparency and Accountability Organisations presents clear, step-by-step guidance to the key phases in a technology project, from defining your strategy, to spending wisely, to tracking outcomes. The guide is also designed to help funders identify projects with the potential to succeed and provide effective support to grantees. Too often, technology projects burn money and staff time, but still lack impact. In ‘Fundamentals,’ author Dirk Slater and experts from our TABridge network distil years of experience into the principles and steps that drive success in technology projects. It also includes appendices that help organisations to match technology tactics to different stakeholders; ensure that projects are guided by a user-centred approach; ask the right questions when planning mobile-based outreach; and enlist data and open data effectively for advocacy. To support our community of practice and deepen the impact of the guide, the Transparency and Accountability Initiative is hosting a series of webinars this spring and summer, based on the guide’s key recommendations. For easy use, ‘Fundamentals’ is available to read online or to download in full or chapter by chapter. Learn more and get started at: http://tech.transparency-initiative.org/fundamentals. I’m in Prague at the Policy Research, Technology and Advocacy Event @ the Hub, run by Open Society Foundations Think Tank Fund. It’s a fascinating event with some of Europe’s best Think Tank minds; I had the pleasure of helping them work through tools that can help them to troubleshoot some of the issues they face in their day to day work. So which tools should be in the Think Tankers Data Toolbox? * Digital Methods Toolkit from the Digital Methods Initiative. Let’s look at the specific problems the group raised and what tools we know to help with them! Special thanks to Dora Hardy from Open Society Foundations for this list! Keen to hear from you which is the best – please feel free to drop comments in the section below. Try asking publicly! Check out online Freedom of information sites on the web such as AsktheEU. Many countries also have their own sites! Tip: Want to see examples of how people have ensured they get machine-readable data (i.e. spreadsheets not PDFs) from Freedom of Information request. See this successful example of asking for the EU budget to see what to ask for! Getting into potentially dangerous territory here, however, one suggestion was made. Open Studio, by Talend – I don’t have experience with it myself, but again – any testimonials from personal experience, please drop them in the comments box. Analysing Data: “I have huge volumes of documents and don’t know where to start”. Projects such as Document Cloud allow you to upload and search lots and lots of documents (even PDFs). Check out also The Overview Project for an example of a tool which helps to visualise common topics in a big dump of documents and links between themes in documents. 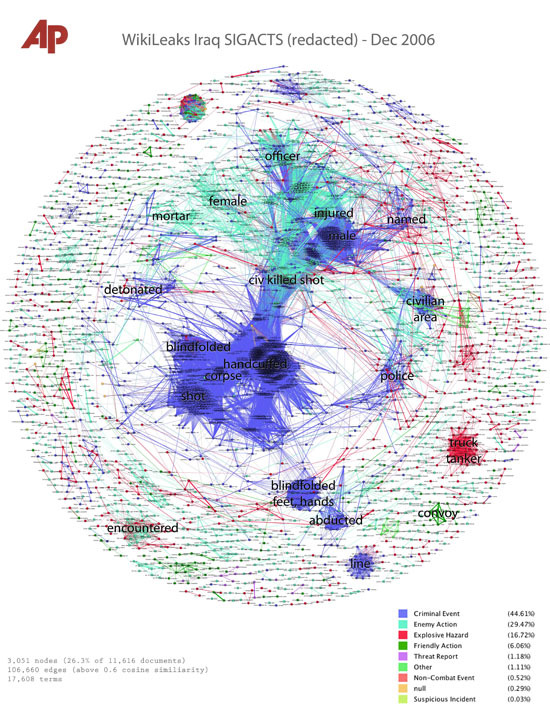 Below: visualisation of the Wikileaks War Logs: Large Words = commonly occurring words, Points = Documents, Lines = show which documents connected to the topics. Sure do! Check out this quick guide – we promise to update it soon to take account of new changes to the Twitter API. The final part of the workshop was dedicated to a quick session on Geocoding. Using a Google Spreadsheet and using some highly refined copy and paste skills from the School of Data tutorial on Geocoding, we created a beautiful TileMill map in the themed colours of ExpertForum. If you want to get a map in your themed colours, you’ll need a colour capturer to grab your organisation’s colours. I used “Hues”, available in the App Store, but there are lots of options available. Black magic After the session, I showed a couple of people how to get data out of tables online where copy-paste doesn’t work. 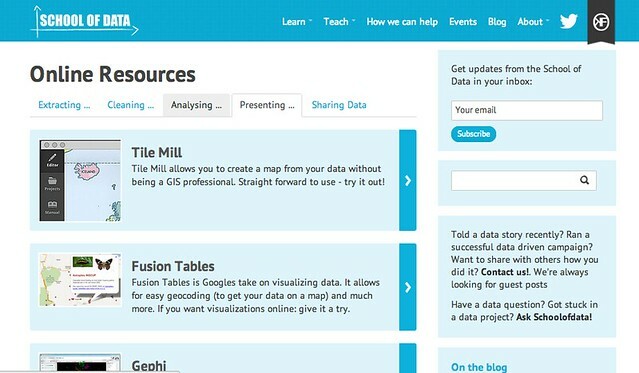 Check out the School of Data tutorial on IMPORTHTML if you have similar problems! Thinking of entering the On Think Tanks Datavis competition? Check out these guidelines by, School of Data Advisory board member, Gregor Aisch (DrivenByData) to avoid committing a visualisation faux-pas. Submissions for the On Think Tanks Data Visualisation Competition close on 20th November. Get your submission in now! Enjoyed this? Want to stay in touch? Join the School of Data Announce Mailing List for updates on more training activities from the School of Data. Learn how to tinker with, refine and tell a story with data in this 4-week course. Each week you’ll be commissioned to work with others on a project that will hone your data-wrangling skills. Lessons will be pulled from Open Knowledge Foundation and Tactical Tech with help from Peer 2 Peer University. At the end of the course, you will have finessed, wrangled, cleaned and visualized a data set and shared it with the world. The course will run April 15 to May 3, and each week your team will receive weekly “Missions” from Mission Control over email. You’ll work together on those projects, including a 30-minute Google Hangout each week. Each “Mission” will lead up to your final project. For each skill you master in the course, you can earn a Badge to show your mastery and to get feedback to further your talents. Carbon Emissions. Don’t worry if you don’t know anything about them at the moment, you don’t need to be a topic expert and the data skills you will learn will be very transferrable to other areas! No prior experience is required, we’ll cover spreadsheets and working with data. If you’re more advanced, you are also welcome to join us to hone your skills, and the only limit on what you can learn is your imagination – so if you’re prepared to push yourselves on the project front the data-skills-bucket is your oyster! Open file in spreadsheet. Open cell. Position cursor. Correct error. Close cell. Move down a row. Open cell. Position cursor. Correct error. Close cell. Move down a row… repeat to row 53,234 or until you fall asleep at the keyboard (whichever comes first). To help speed these sorts of tasks up, we’ve written a new School of Data course called A gentle introduction to cleaning data in a spreadsheet. It contains loads of ways to make cleaning data a quicker and less painful experience. In the course we start with a ‘dirty’ dataset containing lots of common errors. We walk you step-by-step through the process of making it to ‘clean’. We’ll show you how to use a range of common spreadsheet features to find and correct problems such as invisible or inconsistent data, missing values, a bad data structure and so on. By the end of the course, you should leave with a better view of what the spreadsheet can do, a practical process you can repeat on your own datasets and a good idea of how to better find help online about how to use spreadsheets. The course dataset is interesting too. It’s about ‘land-grabbing’, or the commercial buy-up of agricultural land in the developing world by investment companies and governments to grow biofuel and other commodities, turfing people off land they need for their survival and (some analysts reckon) driving up food prices around the world. The data was produced by GRAIN, an excellent research organisation; I hope they accept our apologies for picking on their data in this course! This is the first in a series of three ‘basics’ courses. They all use the same dataset about landgrabbing. The next in the series is a course called A gentle introduction to descriptive data analysis, which is about using a spreadsheet to get to grips with what’s in your data. Hot on its heels will be an introduction to visualising networks. Finally, this course will also illustrate the spreadsheet’s limits. At some point, the time and effort you make pushing a spreadsheet to do something may be better spent looking at tools and techniques specifically designed to tackle the problem. In the case of cleaning data, this might be learning how to use Google Refine. 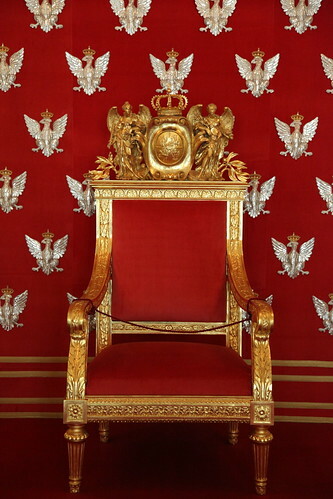 But until that time, all hail the spreadsheet, king of data cleaning.